“To put it simply, guys. Why the hell would I watch how a group of adventurers tries to reach the top of Mount Everest guided by a seasoned mountaineer, after they’ve paid a generous amount of money? An average family could book a few all-inclusive vacations for that kind of money. And it could also be something adventurous where you could admire breathtaking panoramas. Only the chances you’d die during such a voyage is significantly smaller. And just like the traveling journalist Jon Krakauer (Michael Kelly), I asked myself the big question : why the hell would someone decide to do something like climbing Mount Everest? Is it something masochistic? A dream that they are pursuing? Is it about pushing your own boundaries? Or is it to boost your self-esteem, knowing that you are one of few who managed to achieve this? Unfortunately, however, you won’t get an answer to that question here. And yet I couldn’t resist to go watch this movie on the big screen. Partly because I was expecting some impressive images in this mountainous landscape. And this time I wouldn’t make the same mistake as with “Gravity“. I’m not going to wait for the DVD or VOD version and then think of Mount Everest as being a measly little mountain. Even though I have a huge flat screen. “Gravity” turned out to be a deep disappointment. On the other hand there are all these famous actors who collaborate in this film. If you succeed in convincing Jason Clarke, Sam Worthington, Emily Watson, Keira Knightley, Josh Brolin and Jake Gyllenhaal to co-operate in this semi-disaster movie, you’re holding all the trump cards anyway. For me personally, the fact that Jake Gyllenhaal is in it, was already a reason to watch this film. And he didn’t disappoint as the somewhat eccentric expedition leader Scott Fischer (although his contribution is rather limited). Even Knightley (her smile frightens me more than my fear of heights) didn’t stop me. 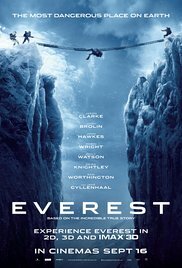 “Everest” can be split up into two main parts. The first is dedicated to the participating mountaineers and their background. Ample time will be taken to study those characters in depth and explain their motives. First there’s Rob Hall (Clarke). A kindhearted person who respects the immense mountain. He’s the first who commercialized the concept of reaching the summit. You could call it a city trip to the summit of Mount Everest. Then there’s Scott Fisher (Gyllenhaal) who leads a competing tour company. An eccentric who couldn’t care less about strict regulations and who has a “we will swiftly climb up that mountain” attitude. And in the field of competitors we first see Doug (John Hawkes), a not so wealthy ordinary postman who almost reached the top before and now is determined to succeed in his final attempt. The only female participant is Yasuko Namba (Naoko Mori) who has already climbed six of the seven major peaks. Then there’s Beck (Josh “Oldboy” Brolin) whose motivation for climbing the notorious mountains is fed by a marriage that is faltering. And finally Jon Krakauer (Michael Kelly), the journalist who wants to make a documentary about this venture. Obviously this is the least action-packed part. The ascent to the top is of course the second main part of the film. Superbly visualized and filmed. The physical suffering and perseverance of the participants is more realistic than expected. You can admire hallucinatory panoramas which make you feel as if you were on that hillside yourself. And when the weather changes drastically, it’s all just about surviving. It’s another demonstration of how small we are as human beings in relation to the elements of nature. A trial of strength between man and nature. Of course, this is the most exciting and intense part of the film. Unfortunately the outcome is known in advance. The only surprise element that remained was who’d survive this hellish journey in the end. What was the cause of this disaster eventually? Was it because of overconfidence? The fact that it was reasonably crowded at the foot of the Mount Everest and thus the commercialization indirectly caused it? Or was it just bad luck that a severe storm hit them? This is a story of human failure in the annals of world mountaineering. That’s irrefutable. But what about all those other victims worldwide while climbing gigantic mountain peaks? Ultimately, one can only conclude from this that we are powerless against murderous nature. Eventually the leading role in “Everest” is reserved for the mountain itself. Notwithstanding the hallucinatory images and suspense, this wasn’t a highlight for me when it’s about movies in 2015.